Every month I read the magazine School Administrator cover to cover. Produced by the AASA – the American Superintendents’ Association it moves from big picture issues, to practical current topics to interesting slices of life from a variety of others who serve in the same role as me. It is my go-to professional journal. Over the last four years I have got to know its editor, Jay Goldman. Jay has been kind enough to take some of my blog posts and turn them into columns for the magazine, and I am right now working on a piece on school sports for an issue this summer. It is not just the relevance that draws me to the School Administrator Magazine but also the quality of writing – which goes back to the tone and standards set by the editor. If anything, being a good writer seems to be more important now than ever for teachers and administrators. And while Jay was speaking about the power of writing in the context of a magazine, this slide is a great slide to answer the question – why blog? 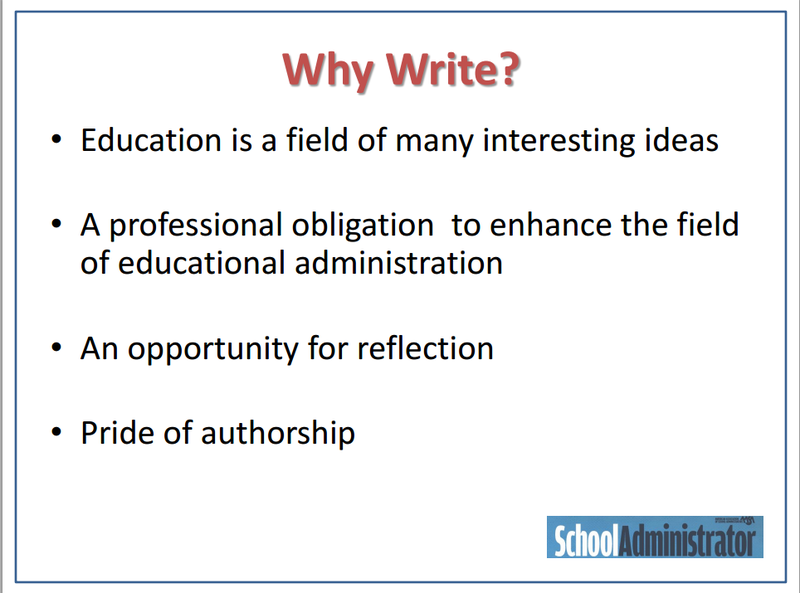 The goal is not bloggers, for our students or the adults in the system – it is writers for the reasons that Jay outlines. What is true is that blogging allows the writing to be more dynamic and allows us all to be owners of our own publishing company. 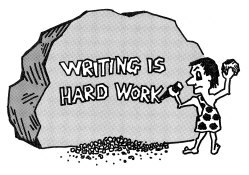 In the end though, writing is still writing and all of us should take up the challenge to do more of it in our profession. I have been teaching in a couple high school classrooms recently, and I have been reminded that students on small hand-held internet devices can be distracted and distracting. I am being intentional in not using the word phone. 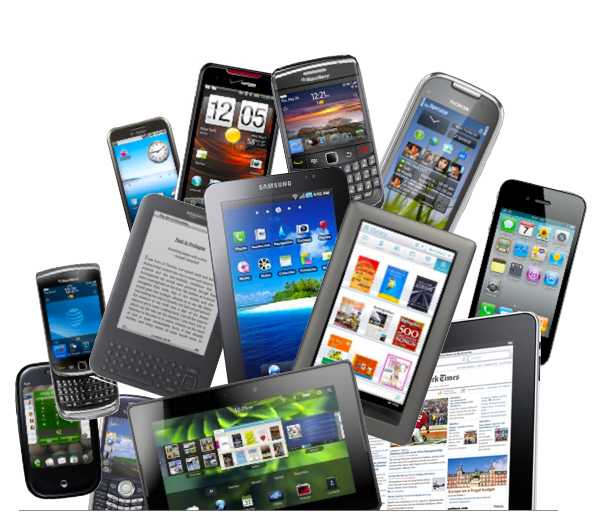 For almost all of us, the devices we call phones are primarily used for other functions. I know for me, the phone is maybe the fifth or sixth most popular use for my small internet device. I don’t think the discussion is about phones vs. tablets vs. laptops rather it is about what functions are best done with what size of device. For more than a decade I have been advocating students bringing internet-ready devices into the classroom. I have said things like, “phones are great, if that is all students have, they should bring them.” And this is still true. I have also regularly said, “If students have a phone and can’t afford a laptop, their families should really consider making a different (better) decision that could benefit the child’s learning.” I know families have invested in phones for a variety of reasons and safety is a reason I often hear. Well, get a cheap phone for emergencies and take that money for the iPhone contract, and invest in a laptop or tablet. Back to my recent reminders. I will focus on one particular class of grade 11 and 12 students I was working with. We were having a discussion around leadership in the digital age. And I have to be honest, the students on their small devices were driving me crazy! I could see the students were distracted, and in turn, this was very distracting for me and others. They were texting away with students in the room and outside the room, only periodically engaging in the lesson. Now, I know it is partly my fault. If my lesson was more engaging, the students would not have been so easily distracted. I also could have done a better job of classroom management. I also know that in our efforts around students bringing their own devices, the journey has not, nor will not, be linear in terms of how students use devices in their classrooms – we are in shifting times. At our District Parent Advisory Council Meeting this past week we had a great discussion around technology that included a high school teacher and a grade 10 student. As the student reminded us, “When kids are on their phones they are usually not doing school work.” Heck, when adults are on their phones it is more likely for social rather than business. I have always been a believer in the key role of adults to model technology use and it is hard to suggest kids just need to behave differently when so often we see parents busy checking their Facebook or Twitter feeds. The power of devices in school is usually around what is possible to create, and with the small handheld devices, in schools they are almost exclusively consumption devices or texting machines. So, the advice of the last decade does stand – that any internet device that gets you in the game is good. But it is also true that some devices are better than others and we shouldn’t be fooled into thinking devices like iPhones are changing learning. I am a bit “old school” and like to type on a keyboard so my advice when asked about what one should get for their child is probably a laptop, or a tablet with a keyboard. More and more other specs matter less, and work lives in the cloud – it is about getting to the internet. And what else was I reminded in teaching classes where all students have technology; technology does not making teaching easier, but it does make it very different.